Xbox One X will have a limted “Project Scorpio” edition available when it launches this fall Microsoft announced today at its pre-Gamescom briefing. What’s so special about the $500 Scorpio edition, which leaked last Friday, you might ask? Well there’s the box which was made to resemble the original Xbox and also has the name of the system in a green font. That special typeface will be on the console itself as well, which also comes in a black, graphite textured casing. And finally there’s the limited edition controller which will also have the words “Project Scorpio Edition” in green lettering, in case you ever forget. This edition also comes with a plastic stand but as far as I can tell there’s not anything unusual about it. 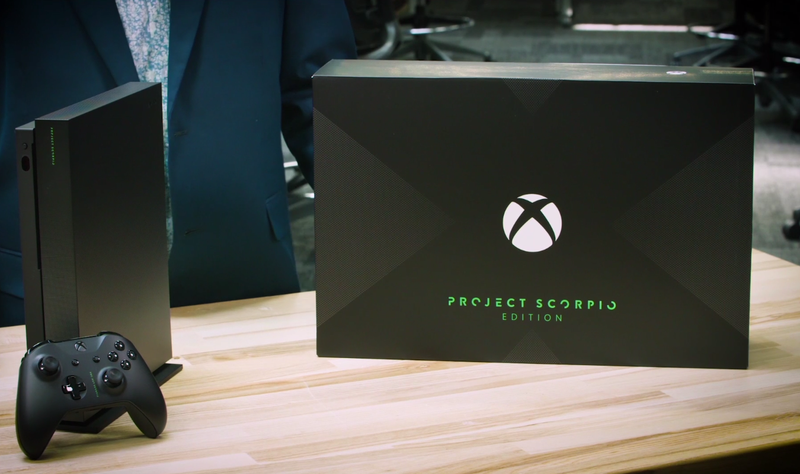 Really though, the best thing the Scorpio edition has going for it appears to be the name, which is way cooler, and always was, than Xbox One X. Reasonable people can disagree about this of course, but, I mean, come on, scorpions are way cooler than Xs. At today’s event Microsoft also announced a Shadow of War Xbox One S bundle for when the game releases on October 10, as well as a limited edition MineCraft version which is painted in green and brown pixels as a tribute to the game’s crafting systems and dirt (their explanation, not mine). The company also explained that games like Halo 5 and Gears of War 4 will be getting free, 4K upgrades in the future to allow these games to take better advantage of the Xbox One X’s native 4K and HDR capability. Around a 100 existing games will apparently see some kind of patch to this effect. Finally, if you choose to pick up the new system, switching to it from your old Xbox One should be pretty straightforward. Microsoft explained that anything you have on an external hard-drive can just be swapped over to the new hardware and games downloaded to the internal storage can be copied over via your in-home network. Settings should automatically carry over from one console to the other as well. And while we’re on the subject of UI, the company also said that a future update will be bringing a “light” mode to the Xbox One dashboard, meaning you’ll finally be able to swap out those dark grays for something a bit more vibrant. The Xbox One X launches on November 7 with the Project Scorpio edition available to pre-order starting today. You can re-watch today’s Microsoft event in its entirety here.